Tuesday night at Kallangur Tavern will see over 40 friends and acquaintances get together for a weekly poker tournament. The Kallangur Tavern has been holding tournaments here for over 4 years now, and yes I have attended most of them. The National Pub Poker League run the event here and currently Renee is the Tournament Director. She is fantastic, she runs a tight game but ensures everyone is enjoying it. The prizes here currently are for first is $50.00 cash, some NPPL merchandise and a seat to the NPPL monthly cash tournament; this is over $5000.00 in cash prizes up for grabs. Second prize is $25.00 cash and a seat at the Monthly Cash tournament also. It could be a cheap night out if you win. It is free to play, and the meals and drinks are well priced for the Poker players. The bar staff are friendly and most certainly make you feel welcome. I start the night with the usual $10.00 meal and a Corona, and my wife also ordered a $10.00 meal, but with a vodka lime and soda, which was almost poured before we ordered. Poker registration is from 6:00pm with the game start time at 7:00pm. If you register before 6:30pm, the host will give you an extra 1000 chips. As you can tell from my reviews, I love to tell you about the tournament as well, mostly because my wife and I play at most of them, and this particular Tuesday night was no different. Play begins, and players start to fall quickly tonight, and unfortunately this included me. By 9:37pm the final table had been decided, and my wife was still sitting there (that doesn't mean she's better than me). Dannii is knocked out in 5th position and by 10:30pm it was heads up poker, sitting across from each other was Jamie (the self confessed cute one) and Matt. Six hands had been played, with Jamie on the small blind and first to act, he motioned that he was ALL IN. Matt thought for a minute and called, turning over Ks Js. Jamie revealed Kd Qd. The dealer showed the FLOP 10s 6s Qh turn Ac River 2 giving the tournament win to Matt with a straight. Great game guys. 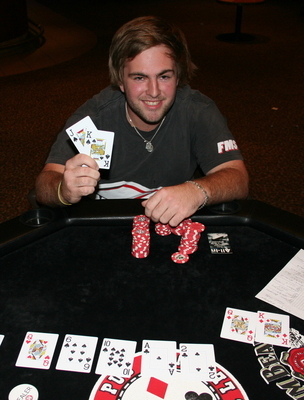 This was a great night out for locals and keen poker players from around the area. The meals were great value and quality and the bar staff were fantastic. The tavern has the KTs Bistro, TAB and the pokies room and pool competitions are played on a regular basis also. So if the partner doesn't play poker, maybe pool is the answer. Where: 1517 Anzac Avenue, Kallangur.